In the last two lessons about Abraham, we learned of the birth of Isaac, his son. Then, when Abraham's loyalty to God was tested, he willingly sacrificed his only son, Isaac. Though Isaac's sacrifice did not push through because an Angel of the Lord spoke and said that Abraham was found faithful. What then happened to Isaac after that? When Abraham was old, Isaac was also grown up too. When he still did not have a wife, Abraham asked his chief servant to go to back to his country and his relatives and look for a wife for Isaac. He specifically told him to bring the woman back with him immediately and will not bring Isaac to her. That is a tall order. Would a woman really come with him and marry Isaac even if she has not seen the man she's going to marry? "O Lord, God of my master Abraham, give me success today, and show kindness to my master Abraham. See, I am standing beside this spring, and the daughters of the townspeople are coming out to draw water. May it be that when I say to a girl, 'Please let down your jar that I may have a drink,' and she says 'Drink, and I'll water your camels too' - let her be the one you have chosen for your servant Isaac. By this, I will know that you have shown kindness to my master." When he finished praying, Rebekah, the granddaughter of Abraham's brother, came out with her jar. The servant asked her, "Please give me a little water from your jar." Then Rebekah answered, "Drink, my Lord." After he had a drink, she also said "I'll draw water for your camels too." The servant was excited looking closely at what happened. He asked about the family of Rebekah and learned that they were Abraham's relatives. He stayed in their house, explained the purpose of his journey and what happened at the well. He also asked for the hand of Rebekah in marriage for Isaac. Laban (Rebekah's brother) and Bethuel (Rebekah's father) then said, "This is from the Lord. Here is Rebekah; take her and go and let her become the wife of your master's son, as the Lord has directed." Rebekah also agreed to go. The servant was overjoyed and bowed down to the ground before the Lord and praised Him. Then, he gave gold and silver jewelry and articles of clothing to Rebekah. He also gave gifts to her brother and her mother. The next day, they immediately went on their way back to Isaac. Isaac and Rebekah got married and Isaac loved Rebekah. You can find this story in Genesis 24. 1. Aa arranged marriage is common in Isaac's time, would you agree to marry someone you do not know someday? 2. What made the servant's mission successful? Why was he able to find a willing bride for Isaac? because of the servant's faith? because God answers prayer? 4. Can you trust God in everything? in your family? finding your future husband or wife? in your school? 1. Ask the children to dramatize or make a simple play from the story of Finding a Bride for Isaac. 2. The 10 camels were instrumental in the servant's knowing how to find the right girl for Isaac. 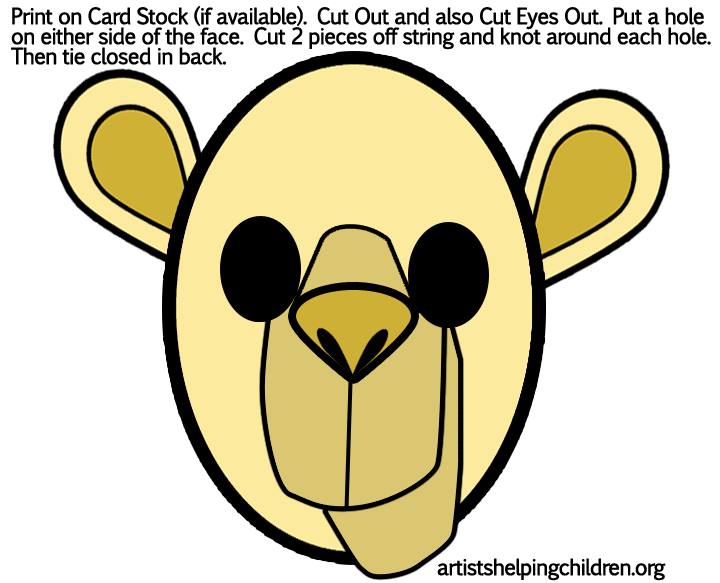 Print this paper camel masks which the kids can also use during the play. 3. You can find a lot of other camel crafts from Artists Helping Children website. 4. Coloring page of Isaac and Rebekah. Trully great is the one that gave Isaac his wife. Nice lesson for children about obedience to God's directives and trust in Him.